Its open-source design means that this small box is bursting with possibilities. In the late 1960s, synthesizers were new, exciting and often the size of trucks. Unfortunately they cost about as much. Fast forward to the 21st century and, while flying cars and matter transmitters remain pipe dreams, many synths are now pocket–sized, and priced accordingly. 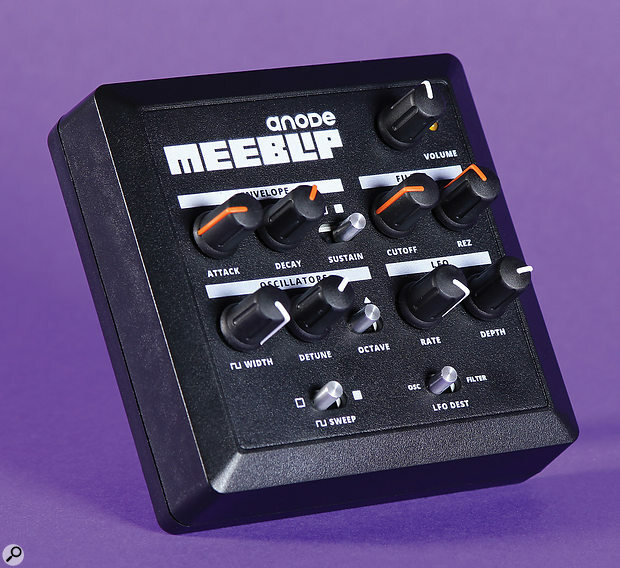 One that almost passed me by is the MeeBlip Anode, a mostly digital monophonic synthesizer with knobs, a crunchy analogue filter and extensive MIDI control. MeeBlip are a Canadian company that teamed up with CDM (www.createdigitalmusic.com) to offer up the Anode as a hackable learning tool as well as a ready source of dirty bass lines and beeps. Sitting on its four rubber feet, the Anode is just 100mm square with a light but tough plastic shell. This seriously compact noise–maker has knobs that are an improvement on the stubby stalks of comparable small fry (eg. Korg’s Monotron range) and switches that are solid and positive. Its audio outlet is in the form of a 3.5mm stereo jack, but don’t let this deceive you — the signal is definitely mono. 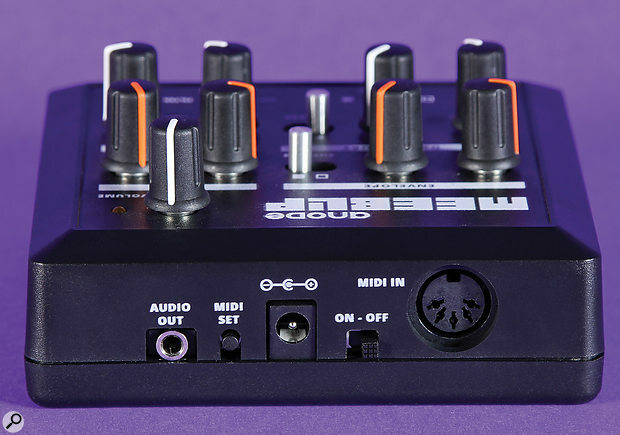 While connections of this size are convenient for lovers of ear buds and the socketry of iPads or Volcas, they’re less welcome if your hardware revolves around regular quarter–inch leads and conventional mixers. Power comes via the supplied 9V external adapter (hopefully not the euro type supplied with the review model) and sadly batteries aren’t on the menu. A single amber power LED doubles as a MIDI indicator and the MIDI In socket is reassuringly tight and firm. Unusually for gear on this scale, there’s an on/off switch. Billed primarily as a bass synth, the Anode features two 8–bit square-wave oscillators, a simple envelope, a low–pass filter and an LFO capable of modulating the pitch or cutoff frequency. The filter is the only analogue component on board and is the main contributor to the aggressive and uncompromising sound. Keeping the knob–count to a minimum, a single pulse–width control adjusts the waveform of both oscillators in parallel, starting at a narrow pulse and eventually reaching a broad steroidal square. Activate Sweep and pulse–width modulation is applied, to the first oscillator only. In this scenario, the pulse–width knob affects only the second oscillator and by giving it a very thin width, its volume can be reduced relative to the first. This, it transpires, is the only way of altering the balance. Pulse–width modulation is achieved by a second LFO that runs freely (and beyond user control) in the background. Its effect is fairly subtle but most evident when you switch the second oscillator down by an octave. This makes it easier to hear the distinction between the gentle swishing of the modulated square wave and the manually controlled width of the transposed oscillator. As well as the octave switch, there’s a detune knob that shifts oscillator 2 independently — up by approximately eight semitones, down by seven. Once you’ve realised this is the available scope for pitch separation, you can begin to exploit brash fifth intervals and fuzzy ‘almost unison’ detunes. Let’s face it: warm and swimmy was never going to be the Anode’s forte, but there is one last way to get tonal variation from the oscillators. The synth responds to notes over a five-octave range and at the bottom end there’s deliberate and obvious aliasing. This is in marked contrast to the cleaner output of the higher octaves, although clean is a relative term thanks to the choice of filter. The filter is a ‘Twin–T’ type. Its creator, James Grahame, first stumbled upon the design in a Texas Instruments technical brief, and again in the January 1970 issue of Popular Electronics where it was used in a guitar wah–wah pedal. It is no historical novelty however, and in this case the filter is configured as a band–pass but with its cutoff set so low it emulates a regular low–pass — or almost regular anyway. The MeeBlip web site provides circuit diagrams for anyone who fancies tweaking it further. The Anode’s rear panel hosts a 3.5mm audio output, a button to set the MIDI channel, an on/off switch and a MIDI In port. Even if you knew nothing about its background, it’s not much of a stretch to imagine the filter as a guitar effect, but fortunately the ‘slightly broken’ tonality is an ideal match for the imperfect square-wave oscillators. Admittedly, the scope is far from exhaustive, but at least you’re not limited to dirty basses; there are nasty overdriven solos, blips, wibbles and leads to be had, all with a certain appeal. By setting the detune knob to unison, the cutoff low, resonance at minimum and a decay around the half–way point, I discovered an edgy sub I liked a lot. Alternatively, with resonance set to maximum you can almost imagine a Korg MS20 coaxed into spitting out distorted, sync–type leads. Which is to say, the resonance also bears little resemblance to that of a conventional filter. Since the knob is a pure analogue control that is not digitally scanned, ‘Rez’ is the only Anode parameter impossible to automate via MIDI. Rounding off, the envelope is fast but not particularly snappy. Its decay and release stages are combined into a single knob and a preset sustain can be switched in to avoid the decay to zero. Both attack and decay max out at around 23 seconds, which is plenty long enough for most uses. Modulation is equally straightforward: a triangle wave aimed at either the pitch or filter cutoff. While the LFO doesn’t quite reach audio–level FM excesses, its values are well spread across the knob’s travel and it’s always easy to find the speed you want by feel (there’s no rate LED). Unusually, the LFO is deactivated at its very lowest rate. With the exceptions of main volume and Rez, every knob and switch has its own MIDI CC. There are even a couple of ‘under the covers’ controls that serve up additional options, namely portamento and filter envelope amount. The occasional dash of portamento breathes life into bass or solo slides and, to add precious dynamics, filter envelope depth is under the control of velocity. This leaves the mod wheel connected to LFO amount, as you’d probably expect. If you were planning to use an Anode or two in a sequencing rig, there’s sufficient MIDI accessibility so that operation can be almost entirely hands–off. Disappointingly, you are limited to a choice of just four MIDI channels, and although that’s three more than Korg’s MS20 Mini, it’s still a bit of a daft restriction. To set the channel, push the tiny button on the rear and turn one of the bottom four knobs. The knob chosen corresponds to the MIDI channel. A far better idea would have been to give the button ‘MIDI Learn’ duties and pluck the channel from incoming data, as many other devices do. Fortunately, this is an open source synth so there’s no reason the behaviour can’t be changed by an enterprising user. The Anode is a tiny digital synth with an analogue filter laced with guitar–pedal grittiness. Nobody would describe it as pristine or hi–fi, but I’d suggest it has enough character to justify the few inches of desk space required. It’s perhaps a shame there’s no audio input to the filter, but I doubt this omission will worry hackers much — and hackers are invited to tweak all wares, hard and soft. Even if you have no interest in coding or soldering, the Anode’s MIDI spec could make it a good candidate to be driven by old–style step sequencers, whether impersonating a crotchety, overdriven TB303 or for generally distorted sync(ish) leads. I won’t pretend 8–bit square-wave oscillators can produce an extensive sound palette, but at the price it’s maybe more relevant that they have a gutsy and insistent presence. The Anode should appeal not just to hackers but to anyone gazing beyond their prissy, clean synths and workstations towards a bit of rough. The Waldorf Rocket is another small, hands–on, primarily digital synth with a characterful analogue filter. It costs around half as much again but is correspondingly more feature-packed. Or there’s the completely digital 8–bit Soulsby Atmegatron with even dirtier multiple personalities and an equally open operating system. Continuing the hackable digital/analogue theme there’s the highly versatile Mutable Instruments Shruthi. Finally, for more conventional analogue tones, Korg’s Volca Keys and Bass are always worth a look when seeking the small and the affordable. MeeBlip’s Anode is shipped fully assembled and ready to go, but its makers believe there are benefits in being open for everyone, not just those who program or solder. Anode’s hardware is therefore fully open source and, with the inclusion of an analogue filter, it’s more hackable than any previous MeeBlip. An internal programmer port is used to modify the firmware and there are plans to introduce a MeeBlip Micro for those who’d like a custom board to build into their own instruments, or to interface with tools such as Arduino. I asked MeeBlip’s James Grahame whether it might be possible to modify the envelope’s decay curve for more exponential zappiness and was directed to the relevant section of the source code (https://github.com/MeeBlip/meeblip-anode/tree/master/Firmware). Sadly I lacked the necessary programmer, but even if I had it, my coding chops are stale by over a decade. According to James, adjusting the envelope rate is as simple as altering the values in a lookup table then re–assembling the code and uploading it to the synth. There are a number of companies that make Atmel AVR programmers for less than £20$20, so whichever way you approach it, digging in and making changes shouldn’t cost the Earth. ...with a filthy, scratchy analogue filter. You’re cordially invited to modify its hardware and software. MIDI control of almost all parameters. The range of tones isn’t extensive. MIDI channels limited to a choice of four. The envelope is not particularly snappy. The MeeBlip is an inexpensive, hackable source of edgy square subs, blips and wibbles, each overlaid with the distinctive crunchiness of an unusual analogue filter.